For sailors who subscribe to the philosophy of free and open content. The year was 1953. It started, naturally enough, with an idea. 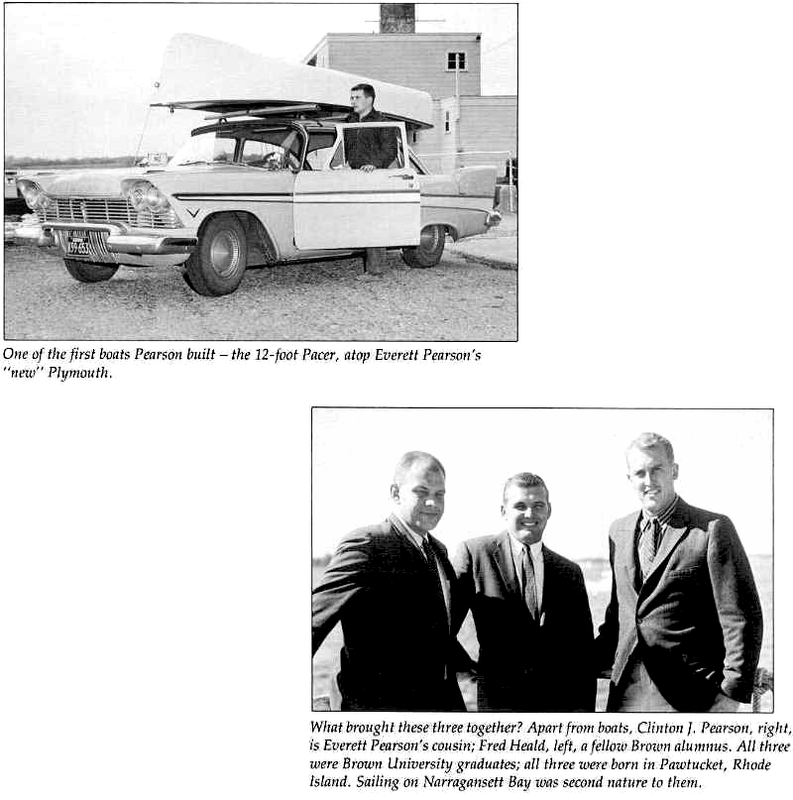 In 1953 Everett Pearson, who had his first boat at 8 years old, was a Junior at Brown University and his cousin Clinton was in the Navy. They had been sailing all their lives and on spring vacation they built a plug for an 8' dinghy and started molding fiberglass boats that summer. Clinton came out of the Navy in 1955 and Everett went in and was based out of Newport. At that time Clinton started building an 8' dinghy and a 15' runabout behind the house out in Seekonk Massachusetts where he experimented before considering commercial production. Clint ran the operation pretty much by himself from 1955-1957, incorporated in 1956, then when Everett got out of the service in 1958 production began. Clinton and Everett and fellow Brown alumnus Fred Heald started out with their headquarters located in the basement of a textile building in Bristol, Rhode Island. "We couldn't even stand up straight while working on boats because of overhead sprinkler pipes". They experimented with glassing techniques and resin formulae as they went along. They became proficient at the art of lofting fiberglass runabouts and dinghies. They built the 8' dinghy and runabouts of 15'-20' until 1959." Up until 1961 were the toughest years of the business, as they used a timeclock and logged 93 hour weeks for four years. Everett said "It was a lot of work and a lot of fun. Selling the runabouts was a real rat-race, kind of like selling used cars, it was a real chore to survive while you bang the boats out in the spring and take them to the show to sell in the fall in a cyclical pattern. We really couldn't see the forest for the trees as to where we were really going. Then in 1959 Tom Potter came to us with the plan that he had, a Carl Alberg design. Tom had been with American Boat who was building the Vitesse 40' Yawl, which became the Block Island 40'. Tom walked in with the plan and we jumped at it! We thought that this would be a goal and a real challenge for us." 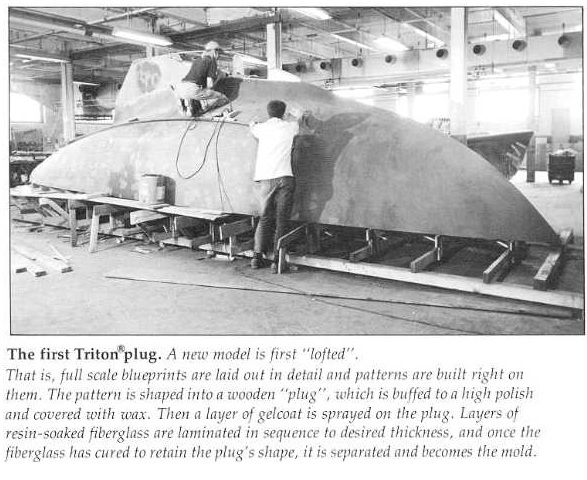 It was 1959 and the start of the Triton project. 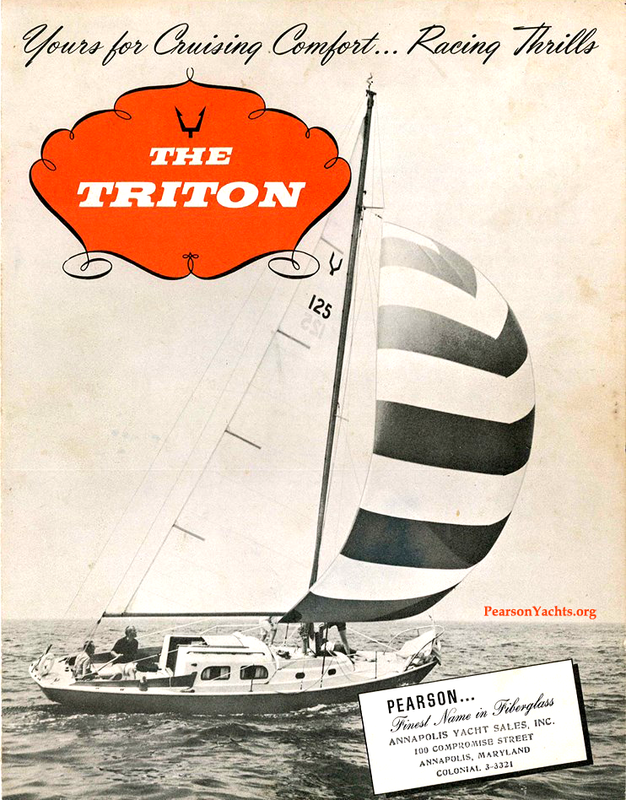 The flagship Triton was designed by Carl Alberg at the request for a "28-footer that sleeps four". It became one of the first fiberglass auxillary sailboats in the country. The design was brought to the Pearsons who worked with Alberg to adapt it to the fiberglass construction which resulted in a roomy interior unlike any comparable wooden boat of its size on the market at the time. They had the opportunity to bring hull #1 to the New York Boatshow in 1959. In preparation for the boat show Everett said "We worked 3 1/2 days straight to get the first boat ready for the show and slept aboard. We loaded it at 2 AM, rode the truck to NYC, the engine still not wired!" At that time, Pearson was down to less than 10 employees and could not come up with the cash for the $1500 balance of the display fee for the NYC Show until a family friend came up with a $3000 loan to get them there. They came back from the Show with 18 cash deposits, all sales direct - no dealers. "We came close to never having our boats." But the Triton went viral at that show with orders upwards of $170,000, so the loan was paid back and the company was off and running. The success of the Triton not only launched Pearson Yachts but also the career of the designer Carl Alberg. Eventually about 750 Tritons would be produced. A quote on Pearson's work in developing construction standards for fiberglass: "We designed the hull laminate from the waterline down so that the boat, laid over on its side with the entire weight of the boat resting on the keel and one square inch of the hull would yield not more than 1/2 inch and produce no structural damage to the boat". In the early 1960's, Pearson Yachts, working in partnership with several famous designers, built a reputation for fine quality construction with sound designs and outstanding beauty and performance. They attracted the attention of Grumman Allied Industries who in 1961 bought a controlling interest in the company and brought stability to the fledgling company. And so began an era of continued steady growth. Everything grew bigger, including the boats themselves. There was a full line of powerboats, and a series of increasingly large and innovative sailing yachts. Among the powerboats was the 34-foot Sunderland; among the sailing auxilliaries, the Invicta 37 and the Rhodes 41. 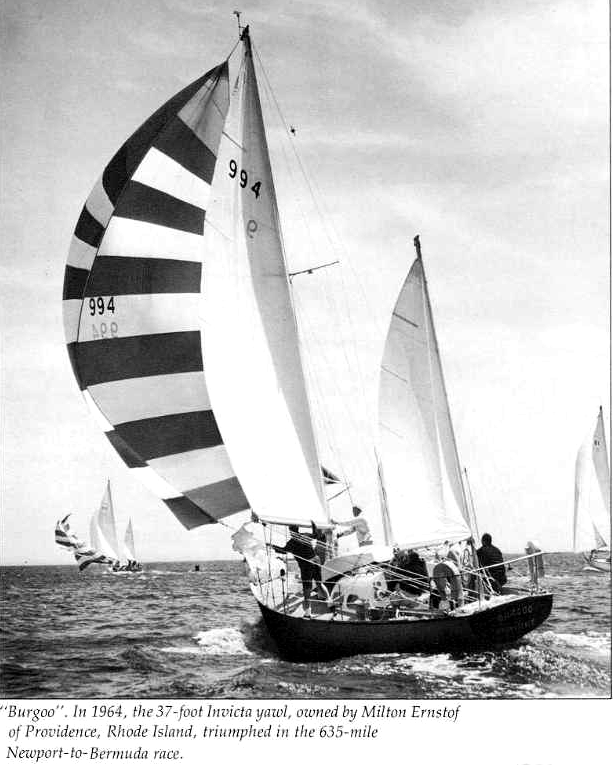 In true entrepreneurial spirit, Clinton left the company in 1964, bought out Sailstar and formed Bristol Yachts, who's first design was Alberg's Bristol 27. Everett left in 1966 to form Tillotson Pearson Inc. (TPI) in industrial applications and boats which included brands such as Freedom, J-Boats, Rampage and Alerion. In 1964 Pearson Yachts had hired a young Naval Architect by the name of Bill Shaw who had sharpened his design skills at the prestigious firm of Sparkman & Stephens, including serving as chief designer of the Americas Cup defender Columbia. He had also exercised hands-on experience building boats in the Far East. He combined the scientific mind of the engineer, the creative eye of the artist, and the realism of the builder and sailor. At Pearson Yachts he carried on the Pearson legacy by leading an in-house design team for a long line of production models at their newly built 100,000 square foot manufacturing facility in Portsmouth, Rhode Island. This location was one of the most prolific boatbuilding operations of their time, providing affordable yachts to the booming market. To this day, Pearson boats continue to sail the world's oceans and are readily available on the resale market. For a new generation of sailors it is an excellent opportunity for getting started in yacht ownership. 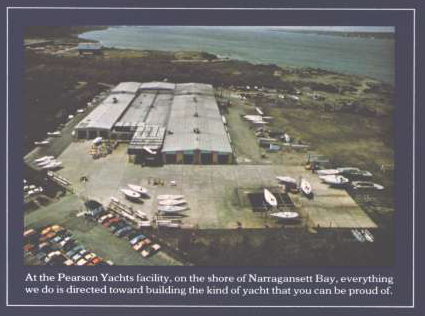 Sadly the company closed its doors in 1991 in conjunction with a major recession in the boat building industry, and no more Pearson Yachts were produced. For more history you will find links below to interesting articles on the web. Perhaps to you a new Pearson Yacht is the finalization of a dream, an escape, family fun afloat. Or perhaps it's a shelf full of trophies. 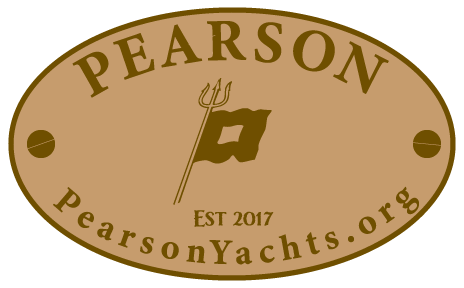 To us, however, each Pearson Yacht is a reflection of the philosophy that there's no place in boating for anything less than the highest integrity and quality. As one of the pioneers in fiberglass sailboat construction, all the experience we have goes into every yacht that comes out of the Pearson yard. Design, construction, performance... all combine to produce a yacht that will continue to do whatever you ask of her. "Design me a 28-footer that sleeps four" was the request….